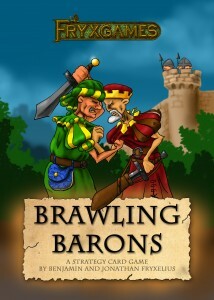 Brawling Barons: 5€ (7€) per deck. Note: All promos and figure sets come in limited quantities. 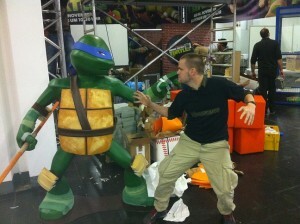 We are now back in Sweden after the magnificent Essen Spiel 2012 games fair in Germany (18-21 Oct). What happened there? Let’s have a look! 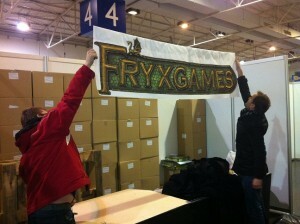 We arrived in Essen early Tuesday and began preparing our booth. With some new decorations produced especially for this event, we were quite satisfied with the result (which is not what you see here). Thomas and Enoch are spreading the cloth banner. Shortly after our arrival, three pallets loaded with our Wilderness games were placed in front of us, and we all suddenly realized how big this event was for us as a small big-family company from Sweden. Our greatest excitement of the preparing day was not Wilderness, however. We’ve seen that game before. 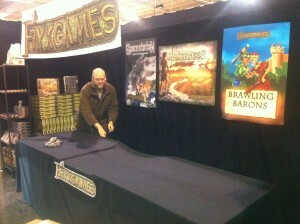 But Jonathan almost fell off his chair when his game Brawling Barons arrived on the scene. This was our first glance at the final result of our product. After some minutes of inspecting the box and all the cards, we could boldly announce to ourselves that we’ve made another successfully printed game! 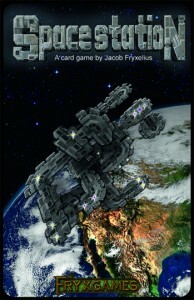 Jacob, the oldest of the brothers attending the fair, is also the game designer of Space Station, which was released last year. 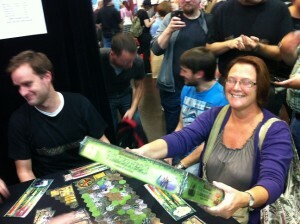 This year, we presented the second edition of the game! With an improved box size, card quality, graphics, rules, and even tokens, this game is now even better. 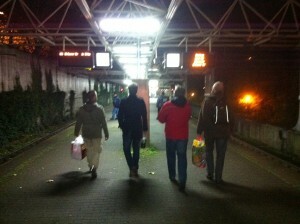 This was also the first game we played in Essen together back at the hotel. To be honest, Daniel had earned some spare time by spending many hours sculpting these lovely tin figures, which we sold separately at the fair, both unpainted ones like you see here, and hand-painted ones. Some of them are meant for use in our game Wilderness, but the angel and demon figures might have a future role to play in some top secret game project. Once the fair started on Thursday, we had constant game demonstrations for visitors in our booth. Wilderness was played eagerly and the fair attendees had to reserve a time to play it due to the massive interest in the game. On the other end of the table, Space Station was attracting visitors of more spacey tastes, and when it was needed, Brawling Barons was explained in the middle. Because our three games are so vastly different from one another, it seemed that we could offer something for just about anyone. Just like last year, when someone won a test-play of Wilderness, they accquired a ticket to the final, Wilderness Survivor. And just like last year, when the final was about to start, a large crowd came by our booth to participate and observe. 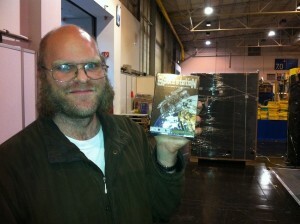 This year’s winner of the final – and thus also a copy of Wilderness – was Gerda van Heel from Holland. Congratulations! 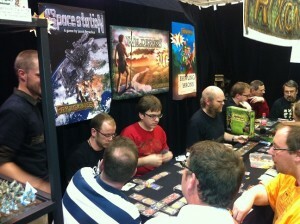 Essen Spiel 2012 has been a great event for us. We’ve met loads of interesting people, played many awesome games, and had an amazing amount of fun. We’ve also seen some exceptional cases in our own games. 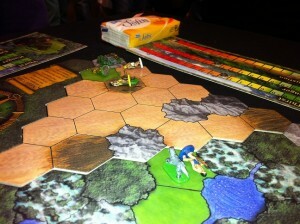 For example, this picture was taken from a gaming session of Wilderness, where all four players died. This is very rare, since the last standing player wins. But in this game, both the last two players were killed by wild animals the same turn. Heading back to Sweden, all of us to different cities, to our beloved wives, fiancées, children, brothers and sisters, and friends, who have supported us greatly. We love you! 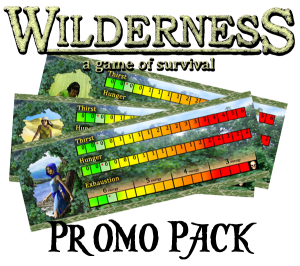 Last year, our hand-made version of Wilderness ranked #2 of all new games in Essen, according to the official geekbuzz (see for yourselves here). Now we return to Essen Spiel 2012, Germany – one of the largest game conventions in the world – to present the printed version of the game. 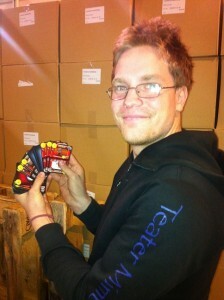 To celebrate this release we will offer a discount price in our booth, only 30€ (instead of 40€). Don’t miss it! 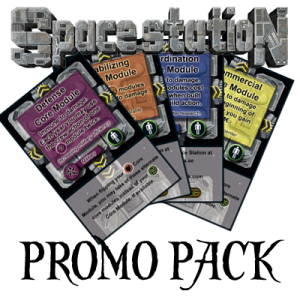 We will also officially release the second edition of Space Station at a discount price (15€ instead of 20€). Our brand new game Brawling Barons will also be released at a discount price (5€ instead of 7€). You are very welcome to booth 4-415 where we will also serve Swedish candy.